Art MacDonald is the nom de plume, or possibly nom de guerre, of the people acting as editor of the Arts Hudson magazine. Art is a character in his own right, an artist and a writer, with his own email address and website. Friend him on Facebook. In this issue we look back at some of the spring’s events, feature an artist using unusual materials and techniques, and give details of the many artistic events this summer has in store for the Hudson region. The Hudson Players Club April production of Lysistrata was fun. The leading ladies enjoyed playing clever and influential women who were decision makers in the Greek court while the men convincingly played bumbling idiots whose thought processes originated between their legs. An entertaining night at the Village Theatre. Also in April, the Hudson Artists took over the Community Centre for their spring exhibition. Experienced artists with an established reputation mixed with talented newcomers to showcase the broad range of styles and subject matter present in our artistic community. Unless your tastes range to unusual non-objective art or wild abstracts, you could find well-executed works to match almost any decor. Heather Dubreuil’s fibre art caught our eye at the exhibition and she is this issue\s featured artist. The Film Society was busy presenting movies, opera and a film festival. The movies are always popular and provide a screen for local audiences to see films they would not normally see in commercial release. “Der Rosenkavalier” was a sumptuous feast of songs, costumes and set with the bonus of an amusing story line. The film festival audiences especailly liked “Wadja,” the Saudi Arabian film about a girl wanting to buy a bicycle. 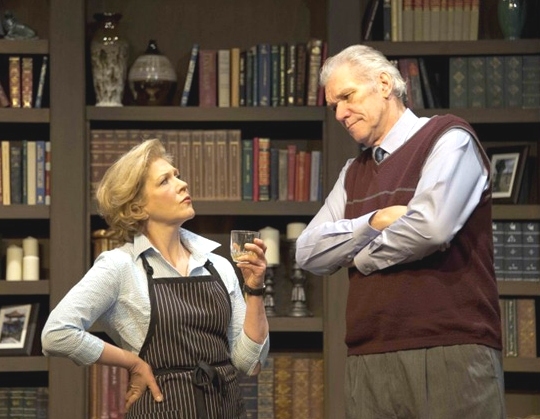 Village Theatre launched its summer season and brought back Norm Foster with “On a First Name Basis,” and people who had missed it last year flocked to see it. Even if you were seeing it for a second time, it was entertaining again as professional actors who had spent months rehearsing their work gave a flawless performance. 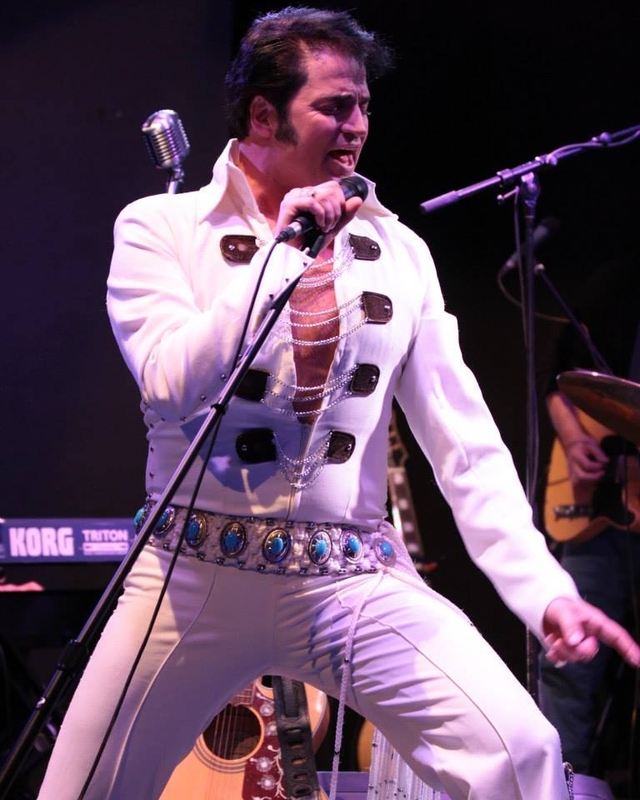 Following Norm Foster, the theatre brought in a C2 Entertainment show called Blue Suede Shoes: the King, the Colonel, the Memories, featuring Elvis Presley impersonator Roy LeBlanc. The show’s creators, Chris McHarge and Colin Stewart also appear in the show. In addition to directing the piece, Chris plays Elvis’ lifeong business manager Colonel Tom Parker, who tells the story of Elvis. Colin Stewart plays in the piece’s band. By June, Greenwood started its events. While tours, teas, music and theatre on the lawn go on all summer, the Greenwood StoryFest has become the major event of the season and one that puts Hudson on the literary map across Canada. This year Margaret Atwood will attend and present her work at Village Theatre. To avoid a last-minute rush such as happened last year with Michael Ondaatje, tickets for all the StoryFest events including the two Margaret Atwood presentations are already for sale online. Visit the Greenwood website for the link. 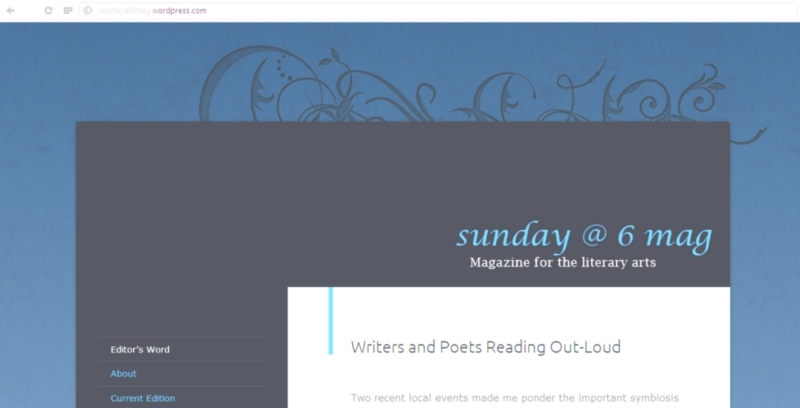 Also on a literary theme, Christine Davet who publishes the online liteary magazine Sunday@6 is the writer in residence at Greenwood this year. Among other projects, she is giving two free writing workshops on July 10th and August 13th. Contact Greenwood for more informtion. Below is an image of a work by our featured artist Heather Dubreuil. 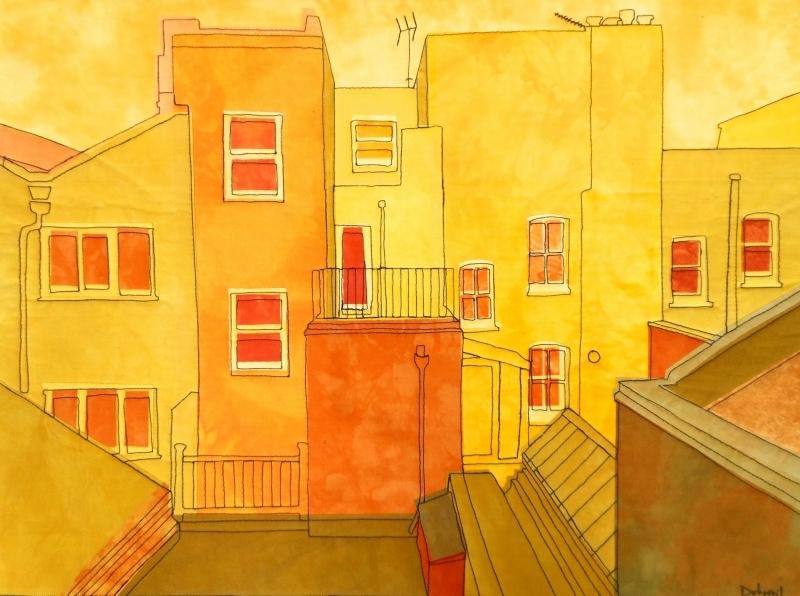 She has been exploring what she calls her “Cityscapes,” works made up of cloth and needlework. She selects or hand-dyes cloth that gives the right colour and texture, cuts out the shapes of buildings, windows and doors, and highlights the edges and outlines with needlework. Sometimes she adds paint or ink, uses patterned cloth or glues the cloth. She currently has an exhibition in Vankleek Hill and will have another one in Montreal in the fall together with our last featured artist, painter John Vazalinskas. The Montreal show is designed to contrast the work of a painter such as John with the work of fibre artist Heather. The exhibition will include works in which both artists create images of the same scene in their respective media. Look for details of Heather’s work and where you can currently see it, as well as details of the fall exhibition in the featured artist section. Back with theatre, we have a page describing this year’s Player Club Shakespeare by the Lake production. The Players Club has taken over the production of outoor Shakespeare from the Shakespeare in the Park group and moved it from Thompson Park to the amphitheatre at Jack Layton Park. This year’s play, “As You Like It,” promises to be lots of fun. The title begs the question, “What is it that you can have or do, “as you like it?” There are several answers and you’ll have to see the production or at least read about it in our article to find out.